In the video above, Mrs. Karle teaches on her “simple” alphabet she created. 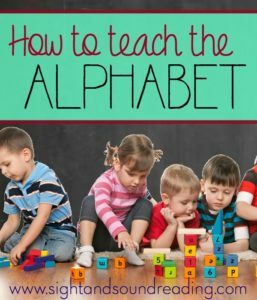 She recommends to begin teaching the alphabet using a simple alphabet so that the students understand the different confusing fonts, the difference between the upper and lower case letters, and to emphasize the vowels. After the students understand the alphabet basics, she moves on to the colorful carousel alphabet that help reinforce the letter sounds.